This is What $2 Million in Scouting Gets You · Let's Go Amerks! So, the Rochester Americans lost to the Toronto Marlies tonight at Blue Cross Arena by the final score of 5-2 in front of one of the smallest crowds that anyone could remember. I feel sorry for all of the players, and while a few of them have made bad mistakes, I’m not going to blame them for this season. During the post game show, Stefan Meyer made a comment about the coaching staff being terrific and if they all continue to work hard like they have been eventually something has to happen. The players had been giving a solid effort, trying really hard, doing their best, until last night. Against the Marlies they just could not seem to get it all together. The Marlies are a team that isn’t doing too well last night, the game should have been different. Talking to players many of them say they’ve never been through anything like this in their lives. During the post game show Stefan Meyer also said, “This is affecting everybody. Away from the rink it’s starting to affect our everyday lives.” He’s not the only player to make comments like that. Meyer also commented about hearing a fan yell about hating all of them. As I stated recently, the players only have themselves. You have fans sitting in the balcony heckling our own players. You could hear boo’s after the Marlies scored, but I’m not quite sure if that was aimed at them, or our own team for screwing up. Only one out of the three local news stations had video highlights of the game on broadcasts at 11 last night. Lewis Staats has said that it’s up to the fans to support this team. What he should have said was that they’re working hard to improve the team so fans will want to watch. The Amerks are tied for dead last with the San Antonio Rampage in the AHL, each team has five points, each team has only won two games. Is it a coincidence that the Panthers used to be a sole affiliate of the Rampage? And all of this is only 17 games into the season. All of this led to me introducing myself to the director of player personnel for the Florida Panthers, Jack Birch. He is the guy who brought us our team from Florida. Since joining the organization in 2004, Birch has served the club in several capacities that included both pro scout (2007-08) and director of hockey operations (2004-07). Prior to joining the Panthers organization, he served as president of J.B. Scouting Service. His worldwide scouting service specialized in the evaluation and rankings of players at the professional and amateur levels throughout North America and Europe. The Peterborough, Ontario native began his career in the National Hockey League when he served as an assistant coach with the New York Rangers from 1985-87. 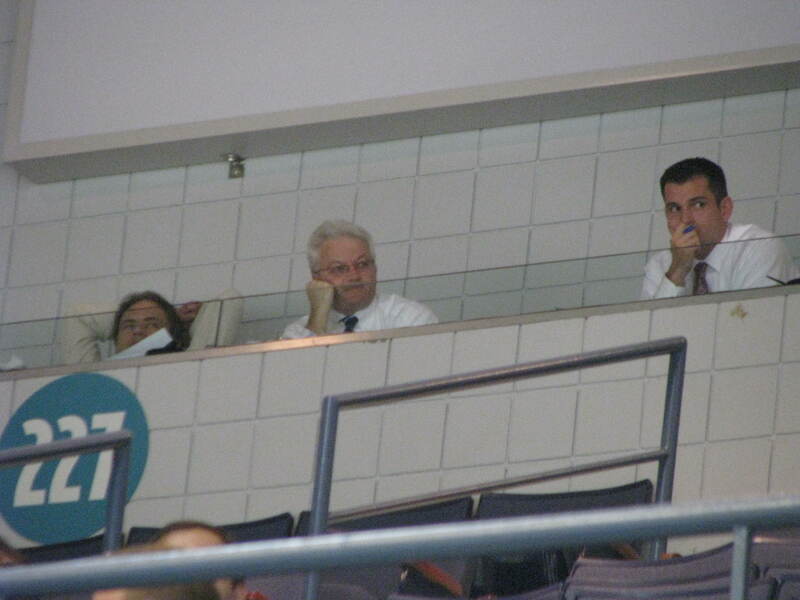 Birch joined the NHL Central Scouting Bureau in 1989 as a scouting consultant to the director of CSB and several NHL teams, and developed a computerized scouting program for the selection of professional hockey players. He spent three years with the CSB before joining the Canucks organization. I walked up during the 2nd intermission tonight to introduce myself and ask what’s being done to improve the team. I approached expecting to hear the company line about “trying,” but instead spoke to someone who appeared annoyed, defensive, and almost argumentative. Which I could understand, sort of. There’s a number of possibilities going on here, all of which I’m speculating. Jack Birch is simply the guy taking the heat. It could be that his hands are tied by Jacques Martin (Panthers GM) and Alan Cohen (Panthers owner). I’m not a professional journalist, maybe someday I will be. I read the news as players get released, or are available, and then signed within 24 hours by another team. I’m passionate about the Amerks. I guess I should have had names ready and able to rattle off the top of my head, and I apologized for not being ready. I’m not a scout, he is. Jack Birch said that he does the same thing, looking for players, and no one has been available, which leads me to believe that players and agents have no desire to work with the Florida Panthers organization. I took a moment to explain to him how dedicated we are as fans to not only the Amerks, but also taken to supporting the Panthers. I told him to come read our web site and we’re not just some “bloggers” trashing the team making up hogwash. I approached again with another Amerks fan who was able to name a number of players, Alyssa also brought him a list of players names. How do you reply to a comment like that when your team has only won two games and is on the verge of losing its 14th game in regulation? We then proceeded to throw names back and forth who are on the Amerks that probably aren’t at the AHL level, none of which I’ll name because it’s not fair to them. Jack Birch was able to defend them saying either they’ve only played in X amount of games, or it’s their first season. The point is, we have a team of young players and rookies that have talent, but not enough to compete and win games. Over the summer we were told by a previous owner, current owners, and Jack Birch that they’d be active in free agency in building a competitive team. We were also told that if that didn’t turn out to be the case changes would be made. One change that has been made was signing Riley Emmerson (which was a good one) to help keep our team from getting pushed around like they did last year. We havn’t been pushed around one game. Another change was swapping David Shantz for Tyler Plante. Maybe it’s not fair to single out Jack Birch, maybe he’s in a horrible position just as the players are to fans taking the heat. I’m not sure. I expected to have a nice discussion where someone would say thanks for being here, thanks for supporting, we’re doing everything we can, but just can’t agree to terms with anyone that can possibly fill any voids. Instead I got the complete opposite, almost made me want to leave. Less than 1,000 people in the building, people are asking the person responsible for providing a competitive team, and he more or less says to get lost. People think attendance is bad now, I can’t wait until a Wednesday night game over the winter when a snow storm is predicted and it’s 10 degrees out. It’s going to get worst before it gets any better. All it would take is for anyone in Amerks’, or Panthers’, management to acknowledge what is going on and tell people they are working together to try and figure something out. I’m an Amerks fan, always will be. This team is being driven into the ground and no one seems to be doing anything about it. Jody Gage, you’ve been an Amerk for basically your whole life. You know the pride and tradition that goes along with this team and it’s dissapearing. Doesn’t that break your heart?